Eastleigh brought a deserved point back down the M27 despite two equalising goals both scored in stoppage times at the end of each half. The result meaning that Eastleigh have still not recorded a victory at West Leigh Park. The injury situation was not improving with Richard Gillespie failing a late fitness test which meant a start for young midfielder Chris Mason, the side therefore remaining the same that finished against Weston Super Mare forty-eight hours earlier. It meant that manager Ian Baird returned to his former Club as a named substitute as well as his managerial role. Eastleigh may not have lost any of the thirteen encounters that these two sides have competed over the past five years, but this result totals the amount of draws in those fixtures to six. Eastleigh did not get their own afternoon off to a very good start with Will Hendry failing a late fitness test though Gareth Barfoot surprisingly took his place in goal nursing a broken finger at the expense of the injured Jason Matthews. Joe Collins and Alex Easton took their places on the substitutes bench. For Eastleigh the game could not have started better. One minute forty-two seconds had been played when RICHARD GRAHAM fired home the first goal of the afternoon after Jamie Slabber had flicked on Ross Bottomley's cross. For your information, I will be on holiday from Tuesday 24th August until Wednesday 8th September. Updates and reports on this site will be far less frequent during this period as can be expected; but usual service will resume on my return to the UK. Eastleigh bounced back from the nightmare trip to Chelmsford forty-eight hours earlier to take a deserved three points home to Maidenhead United. Brett Poate returned to the side at left back with Warren Goodhind switching flanks to the right back position with Ross Bottomley finding himself on the subs bench. There was drama to follow though not all plain sailing. Chelmsford City swept to the top of the Blue Square Bet South League following this victory over Eastleigh with their third three-goal haul of the opening week of the season. Eastleigh kept the same side that had defeated Dorchester the previous Tuesday with a return for Brett Poate to the substitutes bench at the expense of the injured Staforde Palmer. The home side also kept the same line up as they had for their home midweek victory over Woking. Eastleigh Res. v Carshalton Res. Subs: Caleb Porter, Callum Casson, Josh Green, Sam Wiltshire, Callum Nash. Full Time: Eastlegh Res. 1-1 Carshalton Athletic Res. Eastleigh face a big test tomorrow afternoon as they travel to Essex to face Chelmsford City. The Clarets, third in the league last season, have picked up six points out of six at the expense of Basingstoke and Woking. Eastleigh meanwhile, bounced back from the Bishops Stortford opening day defeat by romping to a 4-0 away win at Dorchester on Tuesday night. On tomorrow's opponents Chelmsford; Spitfires boss Baird said: "They've got big expectations." "Their downfall last year was that they couldn't get results at home. "Invariably they get 1,000 up there and they've always had a budget to be challenging." JAMIE Slabber (pictured) bagged a hat-trick as Eastleigh kick-started their season in emphatic style with a 4-0 win at Dorchester Town last night. But as is so often the case with the injury-cursed Spitfires, there was a nasty sting in the tail. Little more than five minutes after entering the game as a second-half substitute, summer signing Staforde Palmer was stretchered off with what manager Ian Baird fears to be another cruciate ligament injury. The luckless Palmer has only just got back to full fitness after his loan spell at Eastleigh from Hayes & Yeading last season was cut short by a similar injury sustained at Weston-super-Mare. Eastleigh wiped away memories of their opening day defeat against Bishops Stortford by comfortably earning a victory at Dorchester Town managed by former Spitfire Ashley Vickers. Manager Ian Baird kept with the side that had competed in the opening game with the exception of Brett Williams replacing Staforde Palmer and taking a striker's role, with Richard Gillespie dropping to the right hand side of the midfield quartet. Ex-Eastleigh players Matt Groves and Jamie Gleeson were in the Dorchester starting eleven with Stuart Douglas on the substitutes bench. Eastleigh attacked from the outset and Jamie Slabber was unfortunate to see his second minute shot saved by home goalkeeper Regan Coward, who also managed to recover to stop the rebound attempt from Gillespie. Dorchester replied two minutes later but Nick Crittenden could only drag his shot across the face of goal. Eastleigh travel to Ashley Vickers' Dorchester Town this evening where both sides will be looking to get off the mark and register their first points of the new season having both lost at the weekend in their opening games. The Spitfires lost at home to Bishops Stortford in their curtain raiser at the Silverlake Stadium, but will have been disappointed not to have come away with three points having had a whole host of clear-cut chances throughout the game. Former Eastleigh defender and current Magpies boss Ashley Vickers saw his side go down 2-1 at Bromley. Brett Williams and Jamie Brown have given Eastleigh boss Ian Baird food for thought ahead of tonight's Blue Square Bet South trip to Dorchester Town, writes Wendy Gee. MANAGER Ian Baird is looking forward to pointing new Eastleigh signing Will Hendry back in the right direction. At just 23, the highly-rated attacking midfielder has never truly settled since leaving Millwall, where he made two starts and one substitute appearance as a teenager. Despite all the to-ing and fro-ing since then, the Spitfires are in no doubt about Hendry's ability. Baird though, concedes that Hendry "seems to have lost his way a bit" and is confident he can steer him back on the right path. From what I'm led to believe Will comes with a bit of baggage, but I talked to three or four people about him before we signed him and couldn't speak more highly of him," said the Spitfires boss. "So-called 'problem players' have never bothered me in any case," he added. "I always point to the example of Rocky Baptiste when I was manager of Havant & Waterlooville. On the opening day of their sixth consecutive season in the Conference South, Eastleigh opened the new 2010/11 campaign with defeat. Ian Baird's Spitfires were made to rue missed opportunities at the Silverlake Stadium as visitors Bishops Stortford claimed all three points. The game was settled by three goals in the space of five frantic second-half minutes, as Stortford opened the scoring only to be pegged back by an instant reply. Eastleigh were on level terms through Brett Williams excellent headed equaliser for just two minutes as Ross Prestedge added to Duane Jackman's goal to restore the Bishops' lead; one which they managed to hold on to despite a number of chances going astray for the hosts. On the opening day of the 2010/2011 Blue Square Bet South league campaign, Eastleigh take on Mark Simpson's Bishops. This season will be the sixth consecutive campaign for the Spitfires in this division. Eastleigh's highest placed finish came in the 2008/9 season where Ian Baird's side finished 3rd and were beaten by Hayes & Yeading in the play-off semi-final. Eastleigh will be boosted by the signing of attacking midfielder Will Hendry who signed for the Spitfires late this week and should be in line for a debut this afternoon. Ian Baird has four players almost certainly ruled out of today's season opener with Peter Adeniyi, Anthony Riviere, Shaun McAuley and Brett Poate all set to miss out through injury. Eastleigh boss Ian Baird has been given a massive boost ahead of the new Blue Square Bet South campaign with the arrival of highly-rated attacking midfielder Will Hendry. Hendry's is a name that normally sets alarm bells ringing among the Spitfires faithful given the damage he has done playing against them in the past. Two seasons ago he scored a penalty in the play-off semi-final, first leg at Hayes & Yeading, which Eastleigh romped 4-2. But it was his appearance as a second-half substitute in the ill-fated return leg at the Silverlake Stadium that set up the Middlesex side for an unexpected 4-0 fight-back, leading to their eventual promotion to the BSB Premier. "Peter Adeniyi, Anthony Riviere, Shaun McAuley and Brett Poate are all injured and we were desperately short of a creative midfielder," explained Eastleigh's director of football Dave Malone..
"And if you talk to anyone about Will Hendry they will tell you what a good player he is. Visit the webpage above, where supporters can register to earn money for their club when they open a Blue Square account. Havant & Waterlooville resume their familiar position as favourites for the Blue Square Bet South division after a sixth placed finish when unfancied last season. The Hawks were one point away from extending their 2009/10 campaign via the play-offs and are now the 5/1 market leaders to win a title that has escaped them for the last six years. Newport County’s runaway success last season led to a host of clubs clamouring for the consolation of a play-off place and that kept the league competitive after the Welsh side confirmed the title. Conference stalwarts Woking almost slipped out of the top five last April as their home form let them down. This season the Cards are joint-second favourites at 7/1 along with Dover Athletic. Eastleigh FC are delighted to announce that the club have today captured an excellent signing in the form of creative, attacking midfielder Will Hendry. The former Hayes & Yeading United star has initially joined Ian Baird's Spitfires on a non-contract basis and becomes one of seven new additions to the Eastleigh squad ahead of the 2010/2011 Blue Square Bet South League campaign. Hendry follows, Chris Holland, Jamie Slabber, Richard Graham, Staforde Palmer, Gareth Barfoot and Brett Williams to the Silverlake Stadium. Eastleigh's director of football Dave Malone is just as excited as the Eastleigh fans as he broke the news to confirm the signing earlier today. Malone said: "Most of our supporters will know Will from his (outstanding) performances whilst he was at Hayes & Yeading. Much to our dismay, he was a thorn in our side when we played them in the play-offs two seasons ago! "Since that time he has played at AFC Wimbledon and Dagenham & Redbridge. Today's game was the last friendly for the Spitfires ahead of the new league campaign when the competitive action gets under way next Saturday (14th), where Eastleigh will host Bishops Stortford on the opening day. Eastbourne opened the scoring with just four minutes played as Matt Crabb's free kick from the right found it's way to the far post and former Havant Waterlooville centre half GARY ELPHICK headed home unchallenged. Despite a disappointing start to the game for Ian Baird's side, to their credit, Eastleigh fought back and looked to be the better team for the best part of the first half. 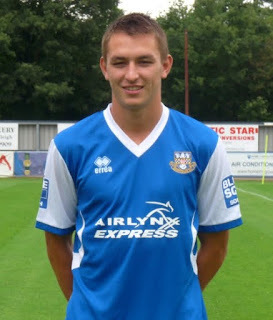 Eastleigh this afternoon completed the loan signing of striker Brett Williams from AFC Totton. Director of football Dave Malone confirmed the signing ahead of this afternoon's pre-season friendly against Eastbourne Borough. (3pm kick off). Malone said: "We welcome Brett back to the Silverlake Stadium - which will be for an intial period of one month." Brett left the Silverlake Stadium club in October 2009 to join Totton for what was said to be "a record fee received for any transfer in the history of Eastleigh FC." We look forward to seeing the striker back in action and it is likely that Brett will be in the squad for today's game. EASTLEIGH last night announced they are welcoming a new director to the club. Mick Budny, who has held the post of director of football at AFC Totton for the last two seasons, will be joining the Silverlake Stadium board in September. With Budny contributing heavily to the playing budget at Testwood Park, Totton twice made the Zamaretto Southern League Division One South & West play-offs, narrowly missing out on their dream of Prermier Division football. With Eastleigh, the Titchfield-based businessman who is managing director of TTL Automotive of High Wycombe, will be climbing two divisions higher into the Blue Square Bet South. The Spitfires' director of football Dave Malone announced: "We are delighted to announce that Mick Budny has accepted an invitation to join the Board of Directors of Eastleigh Football Club Limited. "The appointment (subject to Board ratification) will take effect from 1st September. In Eastleigh's penultimate pre-season game ahead of the new league campaign, the Spitfires welcomed a youthful Southampton side to the Silverlake Stadium for this annual friendly. There was a welcome return to Eastleigh for centre back Aaron Martin who signed for Saints from Ian Baird's side last November. The commanding centre-back was named as captain for the evening and lead the back line well. The game was decided by just a single, very-well taken Southampton goal, but for both sides it was a good work-out and a decent contest in front of a bumper crowd of 1,655. Seventeen-year-old SAM HOSKINS scored what proved to be the only goal of the game when he combined to devastating effect with Ryan Doble. Hoskins looked lively throughout the game and took his goal well to round off a swift passing move from the Saints by firing past Gareth Barfoot and into the net in the 21st minute.